As you know, I can never resist altering a modern photograph in order to give it a vintage feel. The original photograph of Saint Étienne Fontaine du Square Jean Cocteau in Paris is by Daniel Villafruela on Wikimedia which I have blended with textures from 2 Lil’ Owls. First Night Design | Finches Looking…probably for seeds! I’m not particularly good at natural history. I can admire and squeak with delight at a bird or a flower but ask me to name them and I’ll look at you blankly. I downloaded this bird print of c.1879 from The Graphics Fairy and since the inestimable Karen Watson had not specified anything other than ‘birds’, I searched high and low (on Google, of course) to find out what kind of creature I was attempting to ‘doctor’ with my own textures and vintage postcard background. It led me to a site selling prints from another copy of the 19th century book from which it comes. I know now that they are finches. If push had come to shove, I’d probably have said swallows. First Night Design | Now You See It, Now You Don’t! Spot the difference? Well, of course you do. One simple black cat and suddenly it’s for Halloween! And for good measure, below is a large version of The Tree, as available on cards, prints, cushions, bags & duvet covers at Redbubble. The design for both The Witch’s Cat and The Tree was created in a similar way to the Thanksgiving card featured in the previous post. In other words, I used a fairly ordinary photograph of a tree that I took at my local park in Richmond, Surrey, and added several different textures. And, of course, I did my usual experiments with blending states in Photoshop. The finished image as above stands alone and is being sold on RedBubble. 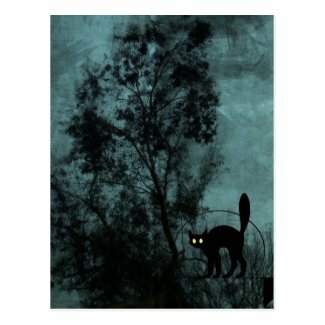 For the Halloween version, The Witch’s Cat, I simply added an arched black cat, as above, from the redoubtable Graphics Fairy. 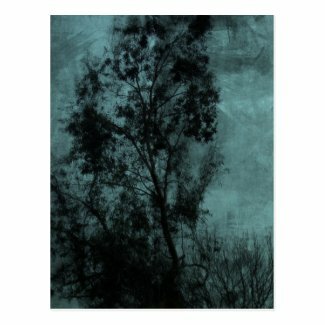 I am in the process of uploading it onto products at Zazzle. 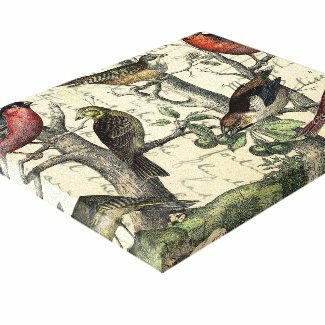 Of all the products available at Zazzle, I love adding my designs to the Avery binders. I’m not sure why it excites me so much but here is The Witch’s Cat binder.